George Hall as Dr. Henry 'Indiana' Jones, Jr.
Lloyd Owen as Professor Henry Jones, Sr.
Corey Carrier as Henry 'Indiana' Jones, Jr. Exclusive Features, Including an Interactive Timeline and Game That Make the Past Come to Life! "From the creative mind of George Lucas comes a must-own, action-packed, 9-disc DVD collection, 'The Adventures of Young Indiana Jones: Volume 2, The War Years.' This second set in a three-volume series includes more than 13 hours of special features that explore the history behind the adventures of one of cinema's greatest heroes: Indiana Jones. Go on spectacular journeys with young Indy as he travels through Europe, Africa, and Asia and comes face to face with Vladimir Lenin, Charles de Gaulle, The Red Baron, and other fascinating characters during the turbulent years of World War I. Then dig deeper into the incredible historical figures and events with the more then two dozen captivating, in-depth documentaries included in this all-new DVD set. Experience the power and the magic of history when you and your family explore exclusive featured, including an interactive timeline and game that make the past come to life! Enjoy the fun and excitement of 'The Adventures of Young Indiana Jones.'" "The Adventures of Young Indiana Jones: Volume Two, The War Years" is not rated. 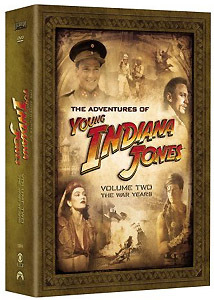 "The Adventures of Young Indiana Jones: Volume Two, The War Years" has the same strengths and weaknesses as "Volume One." You've still got the fun guest stars. This time around you can see Anthony Daniels (C-3PO), Christopher Lee, Daniel Craig, and Catherine Zeta-Jones. You've also got impressive writers and directors. Frank Darabont, Carrie Fisher, and Ben Burtt all lend a hand. And you also have the same crew members that went on to make the "Star Wars" prequels like Producer Rick McCallum, Costumer Trisha Biggar, and many others. But like "Volume One," all of the bonus features center around the history discussed in the episodes and they completely ignore the making of the series. So if you're interested more in the actual production, you're out of luck. "Volume Two" does have one advantage over "Volume One" in my opinion. I always found the "War Years" episodes a bit more exciting than those episodes with 10 year old Indy. You get to see the Red Baron, warfare in Africa, and other cool stuff. With less arguing with his dad and more adult themes, the episodes end up being a bit more engaging. If you're a history buff or a major, major Indiana Jones fan, then I'd recommend this DVD set for you. Just don't pick this up expecting the Indiana Jones you saw in the movies.